In Holding Pattern, Grad Is Waiting To Take Off Yoelvis Bengochea earned a degree in aviation management so he could become an air traffic controller. But in order to find a job, he has to wait for an older generation of controllers to retire. In the meantime, he's working for his family business cleaning pools. Yoelvis Bengochea continues to work for his family business cleaning pools until he can find a position as an air traffic controller. 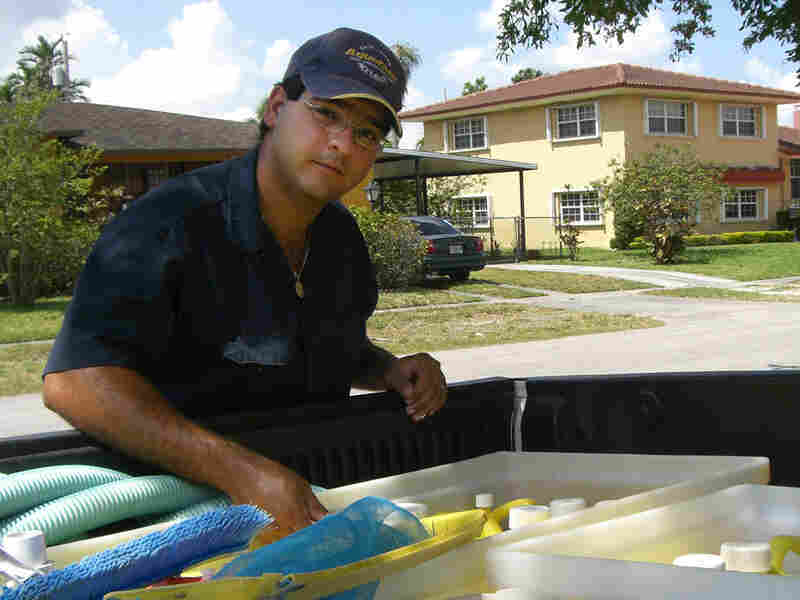 Summer is a busy time for Miami pool cleaner Yoelvis Bengochea. On a recent day, he's scheduled to clean and scrub 15 pools. It's hot and tiring manual labor, and the 25-year-old is hoping this summer marks his last one working for his family's business, Hialeah Pool Supply. Bengochea's goal is to become an air traffic controller. And he just graduated from Miami Dade College, earning an associate degree in aviation management. Bengochea originally started college right out of high school at nearby Barry University. After dropping out, he worked as a lifeguard until he got married and had a son. That's when he decided to go into the family business. He makes $400 a week and is paying off $9,000 in student loans. When Bengochea's daughter was born more than a year ago, he realized he needed another career. "Running a business is a lot harder than people think," Bengochea says. "You give more hours than anybody else; you have to be there longer." Bengochea and his older sister were born in Havana. They are the first generation of their family to go to college. That's one of the reasons why their mother, Maria Alvarez, came to the U.S. Speaking in Spanish, Alvarez says she wanted her children "to have a prosperous future and have many opportunities, because in Cuba the opportunities are too difficult. That's why it was very important for them to be here." As an air traffic controller, Bengochea will likely start at a small airport, making about $45,000 a year. Down the line, he'd like to work at Miami International Airport, where he could make more than $100,000. Right now, he's waiting for his government paperwork to be processed, so he can apply for a job with the Federal Aviation Administration. Bengochea is hoping new jobs will be available after an older generation of air traffic controllers approaches mandatory retirement age. But until a job opens up, Bengochea is staying by the pool. "This job isn't bad for somebody who doesn't have a degree or anything, or that's coming from another country," Bengochea says. "It's just not for me."